Dimensions 0 by 10.87 by 9.62 in. Amazon.com description: Product Description: In this uproarious tale by popular author and Simpsons writer Mike Reiss, Santa recovers from a hectic December by embarking on an hilarious campaign of adventure and self-improvement--from sumo wrestling to international espionage to continuing education (including Elf Esteem and Basic Reindeer Labor Laws). But no matter where he goes or what he does, he's still our beloved Santa Claus. So, thanks, Santa, for all your hard work. Go ahead and take the year off! 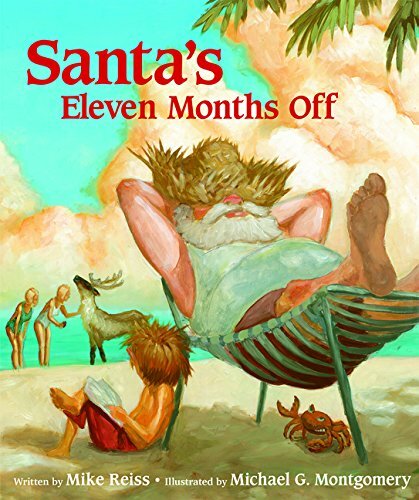 About: In this uproarious tale by popular author and Simpsons writer Mike Reiss, Santa recovers from a hectic December by embarking on an hilarious campaign of adventure and self-improvement--from sumo wrestling to international espionage to continuing education (including Elf Esteem and Basic Reindeer Labor Laws).